The first dinner on our new kitchen table. A hot bowl of chili and apple cider. Yummy for the food and cider and yummy for the new table. I love your new table. It looks nice and big! I am so excited for all the work you have done and now get to enjoy! Blessings on this new table in which I am sure will get many many uses! Beautiful table, looks like oak. Chili sounds pretty good too. I guess I need to make some this week. My hubby loves chili. Looks delicious!! The table is beautiful!! Yum, perfect comfort food to warm tummies as well as hearts! Mmmmm looks good!! The table setting is very pretty! All of it looks good and sounds good! I hope you are enjoying the table! Your new table is beautiful, Kelli. 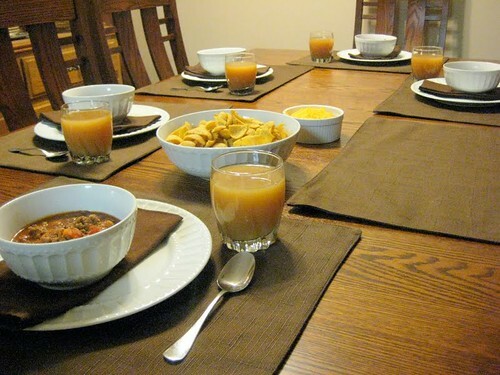 I know that you, your family and friends will make many wonderful memories around that table. What a special evening. I know you will enjoy this table for many years. Your new table looks wonderful! I know you will love it for years to come. Your new table looks great! I also noticed the lighter paint color on the walls. It looks very pretty. Take care! Very nice table Kelli. It always looks so homey at your place. Have a great Friday and thx for sharing. Beautiful new table - how nice for you! With all of the hospitality you lovingly share, I am quite sure the table will be a blessing to others as well!